In the days before Jamie Oliver took on the schools (although not that long ago I hasten to add), and when Spam was a tinned meat, school dinners were very different to the meals that they now offer. The meals themselves I was not normally very impressed with. And we weren’t allowed a drink during our meal, instead we had to collect a cup of water from a trolley at the end of the school hall once the dinner ladies excused us from the table… after plates were cleaned up of all the last morsels of cold, lumpy mash and some kind of fish (?) in some kind of sauce (??). Puddings though, were something different altogether. Who could forget the sponge with pink icing, or chocolate custard, or the jam roly-poly. Mmmm, that was the reward at the end of the gruelling, gut turning meal. My personal favourite though, was Butterscotch Tart. Once I had left primary school for middle school, and traded my weekly brown dinner money envelope for a cool lunch box and flask, Butterscotch Tart was no more. It wasn’t the kind of pudding you could find in the shops and nobody ever knew the recipe for it. For years and years I had no luck, and then later on came recipes which called for tins of condensed milk. This isn’t what I wanted. I wanted a proper recipe, with proper ingredients, that I could make from scratch. So for the first __ years of my life (I’m not telling you! ), I went without my favourite pudding, relying only on the memories of sickly dinners and a sip of warm water before the trophy of the school dinner eating champion in the form of the best pud in the world was allowed. But one day I cracked it! Here is the recipe which will make enough for two 9″ tarts. Mix flour, salt, sugar. Add eggs and softened butter. Mix to a dough and leave in a cool place for 1 hour. Roll pastry and place into 2 greased tins. Bake in oven at 180ºC for 10-15 minutes. Remove from oven and allow to cool. Melt butter in pan. When melted mix in sugar and stir until dissolved. Add flour and milk and whisk until smooth. Heat for a few minutes longer until mixture coats the back of a wooden spoon. Pour onto pastry. Allow to cool then chill in fridge. So simple, yet so tasty! Keep up-to-date and receive our latest news directly to your inbox or RSS reader. You can also follow us on Twitter with the handle @LargerFamily, or become our friend on Facebook too. Lol, tastes can really vary! I dislike any caramel concoction that is NOT condensed milk based. It’s not real caramel, or butterscotch, unless it has condensed milk in it! It seems for you it’s quite the opposite. Oh well, more for me! Which reminds me, I REALLY need to boil a condensed milk can again sometime, I haven’t had the real stuff in at least a year now. Mmmmmm butterscotch tart. My personal favourite is chocolate magic pudding. School dinner puddings are definitely one of the perks of being a teacher. Now I’m on mat leave my boys come home saying “mummy you missed your favourite pudding today” I found a recipe the other day. I really must get round to making it. Ooh let us know how it turns out! 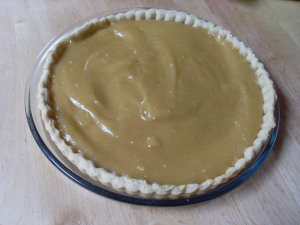 I just made this I could eat the butterscotch all by itself I only made one tart and am using the rest in cakes later thanks for the recipe its great. I have an actual primary school recipe from 2012 for butterscotch tart. For their pastry they used flour, wholemeal flour, margarine, white fat and water. For the filling they had margarine, demerara sugar, flour and milk. Thank you, Joanne! Oh, those were they days indeed!